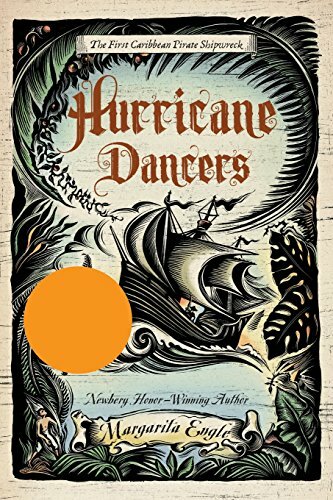 Told in blank verse, this story of the early pirates touches on a universal theme of children growing up without adequate adult role models. Quebrado’s mother died in a plague that took her village. His father became a wanderer leaving his son alone with only an abandoned horse. The broken boy spends his life accepting sad truths. Quebrado is called a “broken boy” because he is half islander and half outsider. He is descended from the Taino Indians and has Spanish ancestry. When he is shipwrecked on an island, he exchanges his Spanish ancestry for his Taino heritage. He becomes a slave on Bernardino de Talabera’s ship. Talabera is the first pirate of the Caribbean Sea. Also on board is Alonso de Ojeda, a hostage, formerly a Conquistador, captured by Talabera. Quebrado’s ability to speak both languages is an advantage to the pirate. With no place to hide on the ship, Quebrado is often crushed like a cockroach. The pirate Talabera convinces his superiors of his intentions to get a doctor for the Conquistador. The dead spirits of the tens of thousands he has killed haunt him mercilessly. When a hurricane sinks the ship, Quebrado struggles to swim in rain that feels like slivers of glass. The slow brigantine catches fire during the storm, the hostage is set free, and the remaining sailors escape the flames by jumping overboard. Ojeda, the hostage, barely escapes the hold—but does so by leaning on Quebrado. Quebrado is rescued by a turtle hunter and taken to a cavern. He is surprised to find people, birds, and dogs. When he finds a horse, he practices all the skills his father taught him when he was small. Eventually Quebrado must make the decision of what to do with the pirate captain and the warrior. Deciding is torment, and the reader becomes invested in this boy who discovers the value of a human life. In this fictional account of historical events, Quebrado is the only invented character. The book offers history lessons set in 1509–1510. During this time period, every seven vessels that left Europe either sank or storms wrecked the ship. As an added bonus, the author includes important factual details in the Historical Note at the end. JoAn Watson Martin is an educator who taught both public schools and as an adjunct university instructor. Her writing has appeared in numerous magazines. She is the author of teen novels, Yankee Girl, Goodnight Mrs. Dinglewall, and Inventing Chloe. Her first adult romance novel, Retrieving Morning, was published in 2009.